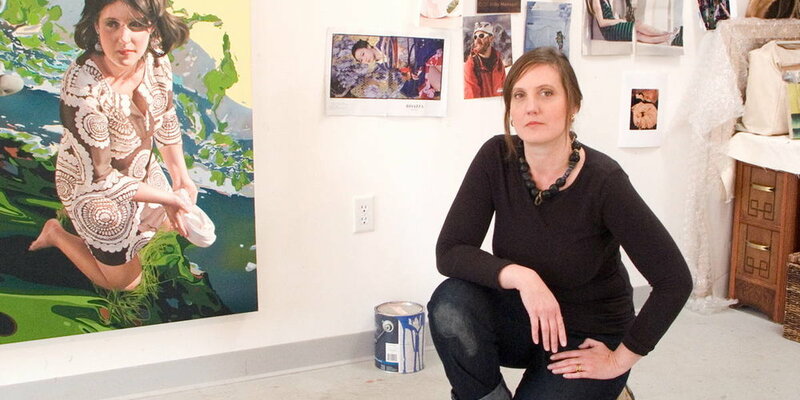 Jennifer Nehrbass is a painter living and working in Albuquerque, New Mexico. She was born in West Bend, Wisconsin in 1970. She received her B.S. in Art and Textile Design from the University of Wisconsin, a MA in Painting from New York University, and a MFA in painting from the University of New Mexico. She spent 10 years working as a Design Director at Ralph Lauren before pursuing her art career. Her work is in in many private collections in the United States as well as Europe. Recently her work was included into the Elizabeth A. Sackler Center for Feminist Art: Feminist Art Base at the Brooklyn Museum. We are exhibiting paintings from Jennifer's “Pioneer Project”; in this series the work examines the European exploration of the West through a female perspective creating a fictional narrative. Objects found in historical institutions are reexamined and reinterpreted. Landscape paintings once used to romanticize and to politicize notions of manifest destiny, are now recreated. The landscape images are collaged from various locations to become the idealized vistas. Presented with many historical narratives are portraits of the protagonists. Here female portraits explore the notions of women as the explorers, the documentarians. They are of different races and ethnicities, a mix of different times and influences. The women are indicative of the cross pollination of appropriated culture and spiritualism.